On wines, winemakers and wineries, primarily of southcentral and eastern Pennsylvania and northern Maryland. A reporter/editor who has picked grapes during harvest at Basignani Winery and looked forward to the barrel tasting and library sale at Woodhall Wine Cellars, both in Maryland, and bopped around the Uncork York and Brandywine Valley Wine Trails in Pennsylvania. Using this forum as almost a wine beat, educating others as I learn about wine, winemaking and the business of growing and then harvesting the grape. which you can find on their site. 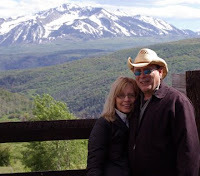 He wrote: "We were totally amazed with Colorado and the wines. Vineyards were between 4000 and 6500 feet high and I expected cold climate grapes. However they have more degree days in some of their areas than Napa. Many of the wines we tasted were in the 14 to 15+ % alcohol area. Although they have their challenges, they do not have the humidity, diseases and insects that we have on the East Coast. I don't believe that I ever had a 15% alcohol wine from anywhere on the East Coast." Terry Sullivan said earlier this week that he and his wife Kathy created Winetrailtraveler.com back in 2006 to educate others. But it also has taught them a thing or two about wine as they’ve traipsed around the country reviewing wineries. Having both recently retired from careers in education, they were searching for the next chapter in their lives. Securing a loan, they were off on their mission. Originally they would write one article that feature several wineries, but soon noticed that they received better reaction from the wineries if they focused on one per article. All told, they’ve been to 233 wineries, including a recent all-paid trip to Colorado that netted a number of stories and some gorgeous pictures, some of which have been uploaded to accompany this story. One issue that seemed worth raising is this whole sweet/dry debate, one ythat already has fueled a number of stories on this site. Do they see the predominance of sweet wines in this region as unique? No, Terry said. “I think its very prevalent,” he said. “America talks dry and drinks sweet. The diehard dry fans would argue that statement, but there are a lot of people new to wine, moreso now than ever before, who start by drinking sweet. You still have a lot of beer drinkers, and they normally go to a sweet wine if they have to rink a wine.